Infradapt is an IT company covering all aspects of IT including Voice, Data and Cloud. We specialize in understanding the impact of IT in your business in order to custom tailor a complete IT business environment to your needs leveraging a combination of Cloud and Premise resources. Infradapt offers a simpler way to experience technology: brand new hardware, the latest software and comprehensive support for a single fixed monthly price, no surprises. Managed IT Services, Voice, Data, Cloud and Helpdesk, the entire IT Department your business wants and all IT Infrastructure your business needs, without the capital expenditures. Gain access to Cloud Computing through the powerful Infradapt Cloud Infrastructure a robust, cost effective and guaranteed environment; everything at a predictable fixed price. Contact an Infradapt Solutions Specialist at 1-800-394-2301 to explore how Cloud Computing and Hosted Infrastructure solutions can benefit your organization. 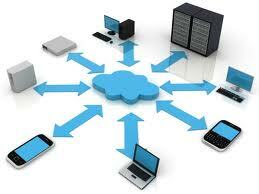 Cloud Computing and Cloud Communications are Safer, More Cost-effective, and Incredibly Flexible. 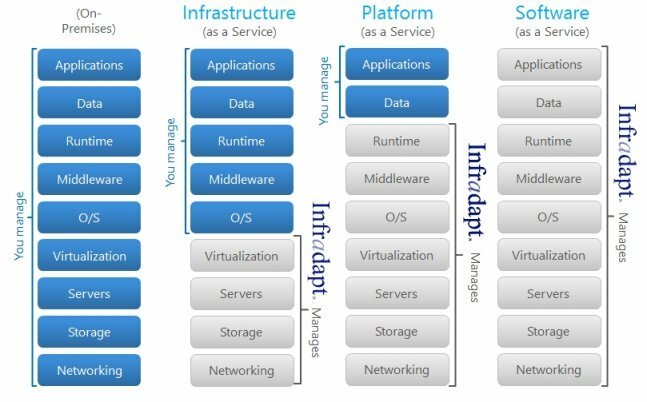 Infradapt Cloud-based computing resources are less expensive and more resilient than hardware; delivering higher up-time, network responsiveness, and scalability while offering a lower Total Cost of Ownership than premise-based hardware. Whether you need a single server for a small workforce or dozens of servers to support a distributed enterprise, Infradapt’s solutions offer the enormous benefits of cloud facilities without privacy or security drawbacks. Cloud computing resources offers a hassle free, simplified application and computing service for users, leaving the storage, security, hardware, and infrastructure headaches to Infradapt as the service provider. Infradapt offers Private Cloud and Hybrid Cloud where access to and from is provided using encryption technology. We understand the regulatory and security standards of different industries, and the requirements of publicly-owned companies for handling credit card information, health records, and financial records. Infradapt cloud environments are a true private, single tenant, share nothing environment. Infradapt’s dedicated private cloud solution delivers true privacy; strict safeguards, including firewalls and private networks within the cloud, ensure that your data remains under your exclusive control. Fully Managed Private Cloud Infrastructures. (IaaS) is a Private Cloud fully managed by Infradapt from server configuration to helpdesk calls. In either case you can count on complete infrastructure support with the advantage of fixed rate plans.